Italian teenager Renato Paratore underlined his class and marked himself out once more as a name to watch when he captured the Portuguese International Amateur Championship at Montado Golf Resort. The 17-year old from Rome finished on seven under 281 (68 69 74 70) alongside England's Nicholas Marsh (71 72 72 66) and went on to clinch the title with a par at the first extra hole. Sweden's Marcus Kinhult (72), who led by a stroke from Paratore overnight, finished third on 282 with Spain's Javier Sainz fourth on 284 ahead of England's Ashley Chesters and Spain's Ivan Cantero. Winner of the Junior Orange Bowl last December, Paratore was 38th in last season's Italian Open in Turin. "It was a very tough battle," Paratore said. "Even from the mental point of view because so many players had a chance to win. "I played with Kinhult, who I had overtaken on the third hole, so when we got to the 18th, I assumed I was a shot ahead. I hadn't heard about Marsh's comeback. "I looked at the leaderboard and tried to make a birdie to get back on top, but my second shot went a little. It didn't affect me and in the playoff on the ninth — one of the hardest holes out there — we were both in trouble but I managed to keep my concentration and come out on top. "I didn't do anything special after winning the Orange Bowl last year but just continued working on the same things as before. "But it was a victory that gave me the confidence to go on and affront the future with even more determination." The Island's Paul McBride headed the Irish challenge, finished tied for 24th on three over 291 after adding a closing 71 to previous rounds of 72, 75 and 73. The Ulster Boys champion started at the 10th and birdied the par-three 12th and the 14th to turn in two under. He then bogeyed the par-five second and followed a birdie at the fourth with a bogey at his final hole. Faithlegg's Robin Dawson, the Irish Boys champion, made just one birdie in a disappointing, four over 76 to finish tied for 41st on eight over 296 (74 70 76 76). Jordan Hood is the only Irish player inside the cut mark after 36 holes of the Portuguese International Amateur Open at Montado Hotel & Golf Resort. 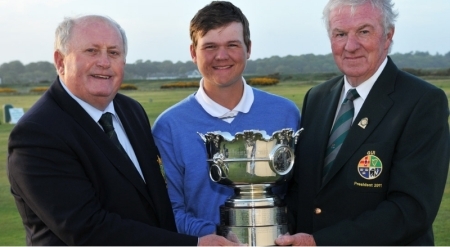 GUI President, Eugene Fayne (right), presents the Irish Amateur Open trophy to Rhys Pugh (Wales). Also pictured is JJ Murphy, Captain, The Royal Dublin Golf Club. Credit: Pat Cashman, courtesy GUI.Welsh teenager Rhys Pugh took a giant step towards securing his Walker Cup place when he claimed the Irish Amateur Open after dramatic three-hole aggregate play-off at a wind-lashed Royal Dublin. As Greystones’ Paul Dunne agonisingly missed out on the extra time action by a shot after lipping out at the last, the 17-year old international from Pontypridd grabbed the first senior win of his career when he beat 22-year old Scot Gordon Stevenson by four shots over the 16th, 17th and 18th in winds gusting over 30 mph. The Island's Paul McBride recovered from a horror start to lead the Irish hopefuls after the first round of the Portuguese Amateur Open Strokeplay at Montado near Lisbon.